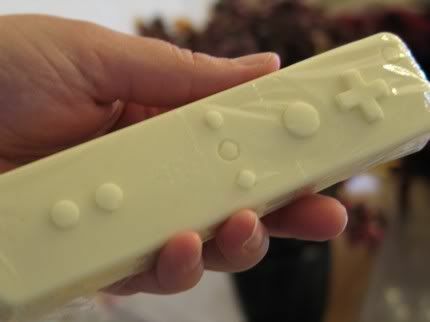 Between the PlayStation controller shaped soaps and the chocolate Nintendo utensils, maybe I should just turn QJ into a "quirky gaming products" site instead, geesh. Now don't get me wrong, I love what Etsy stands for and I'm happy that so many smaller crafters can get their products out there on the web. There are tons of products I never would've seen otherwise, and it's wonderful. I certainly can't complain about all the silly gaming crafts I've seen there either. Add some chocolate? Oh yeah, I'm sold. But yeah, it seems like everything is being shaped into video game controllers now! I guess it might as well be chocolate, huh? There are also blue, green, and brown PlayStation 2 controllers.